(Bloomberg) -- No change at the Bank of Japan. That’s the unanimous view of economists for the two-day policy meeting that concludes in Tokyo on Friday, leaving the BOJ increasingly out of step with the U.S. Federal Reserve and the European Central Bank. With Governor Haruhiko Kuroda set to stick with his current interest-rate and asset-purchase settings, BOJ watchers will focus on how he explains the recent weakening of inflation in Japan. The contrast with other economies is particularly stark this week, after the Fed raised rates on Wednesday and the ECB on Thursday said it would halt its bond-buying program by year-end. The divergence in policy may add pressure on the yen to weaken, helping Japan’s exporters and assisting the BOJ’s inflation campaign by increasing import costs. The policy statement will be released around midday, followed by a press conference with Kuroda at 3:30 p.m. local time. 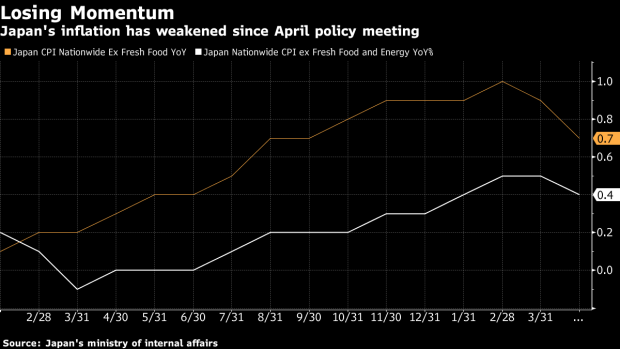 Japan’s consumer price index, excluding fresh food, rose at a slower pace of 0.7 percent in April, leaving the BOJ further from its 2 percent target than at the last policy meeting and pushing the likelihood of an increase in rates further into the future. Any change on Friday in the BOJ’s assessment of current CPI levels to reflect the latest data could foreshadow a softening of confidence in price projections due for review next month. If there is a downward assessment, Kuroda is likely to make every effort to play down the policy implications. To date he’s maintained the view that price momentum, including a tight labor market, is still in place. Kuroda has also emphasized the importance of continuing with persistent monetary easing, regardless of policy divergence with the Fed and ECB. The BOJ’s bond purchases have dropped well below its guideline for buying 80 trillion yen of debt annually, leading some strategist to suggest that reference to this figure could eventually be removed from the policy statement. But such move would also risk of rekindling premature exit talk.